How clean is the air you breathe? If you live or work in a city then chances are the answer will be a bit of a shock. Despite great advances in remediation and reduction in the sources of air pollution in recent decades, there still exist numerous sources which put serious pressures on the health of urban residents. Air pollution reduction is often quoted as one of the many benefits of green roofs but this property has not been specifically studied as often as the cooling properties or rainwater retention for example. Using my recent empirical study on air pollution reduction by green roofs as a backdrop (Speak et al. 2012), I will discuss how effective they can be. View from Blackfriar’s Bridge over the River Irwell, 1870’s. Engraving by Charles Roberts (Evans Picture Library). The Clean Air Act of 1956 was introduced as a reaction to the Great London Smog, caused by burning low grade, sulphur-rich coal in a winter temperature inversion period, which caused an estimated 12,000 excess deaths. Since then, the quality of the air in our cities has gradually improved thanks to a switch from coal to gas, industries moving out of city centres, and improvements in the technologies that reduce emissions. So now, air pollution feels like something that happens far away in Los Angeles with its daily photochemical smog cycle, or in the permahaze-shrouded megacities of China where coal is still a major energy source and car ownership is increasing exponentially. Well, don’t breathe too deeply when walking down the high street just yet. The reason is road traffic, which is responsible for most of the main contemporary urban air pollutants – carbon monoxide (CO), polyaromatic hydrocarbons (PAHs), oxides of nitrogen (NOx) and particulate matter (PM). The latter consists of fine particles, smaller than 10 micrometres in diameter (a human hair is about 50 micrometres wide) which can penetrate deep into the lungs, causing inflammation and allowing harmful substances present, such as lead and copper, to exert effects. Car ownership in the UK is still increasing (DfT, 2009), despite efforts to convince people to cycle or use public transport, and this is offsetting the impact of vehicular emission controls. These emissions are linked to 50,000 premature deaths a year in the UK, and shorten life expectancy by an average of seven to eight months. 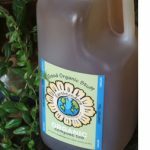 They have also been linked to childhood asthma and even type II diabetes. So, the effects of air pollution are a bit more profound than just a blackening of bogies, personally experienced in London – a place not lightly called ‘The Big Smoke.’ Just because it is invisible, and only infrequently mentioned in the newspapers, does not mean the problem has gone away. Technologies to reduce vehicle pollution at its source seem to have stalled so a lot of research is being carried out on ways to tackle pollution removal once it has been emitted. Monitoring stations have been set up around Manchester, and many cities worldwide, to provide information on the urban background air quality. Most days the air quality in Manchester is acceptable, but there are spatial and temporal patterns to be aware of. For instance, there is a peak twice daily coinciding with rush hour traffic, and this appears to be strongest in the city centre and on a Monday morning. Also, roadsides are places to avoid being for long periods of time. Interestingly, a study in Lancaster found that if you are walking on an inclined road it’s better to walk on the side of the road that cars goes downhill because trees on the side of the road next to cars driving uphill were found to have higher loads of PM pollution on their leaves from the increased emissions of cars struggling up a slope (Maher et al., 2008). This particle-capturing property of vegetation is being exploited to improve the air quality in cities. Strategic roadside tree planting can remove a large amount of pollution by trapping it on the leaf surface where it is subsequently washed off by rains. This is yet another example of the benefits of urban greenspace. Tree-planting schemes are hindered, however, by a general lack of space within cites, and the fact that there is a considerable dollar sign attached to urban land. One solution is to use the space afforded by rooftops and install green roofs. Rooftops are, however, quite removed from the roadside location of the major emissions and can only be expected to capture air pollution carried to the roof zone by winds. Also, there is less leaf surface area, for capturing pollutants, on a green roof compared to a tree. So, what effect can green roofs have in reality? A number of modelling studies showed promising results, with 1675 kg of pollutants, including NO2, SO2 and PM10, being removed by 19.8 hectares of green roofs in one year in Chicago (Yang et al. 2008). A study in Toronto found that 58 metric tonnes of air pollutants could be removed if all the roofs in the city were converted to green roofs, with intensive green roofs having a higher impact than extensive roofs (Currie and Bass, 2008). Both studies used computer models which rely on pollutant removal rates calculated for non-green roof plants and can possibly over-estimate removal. Therefore, there is a need to quantify pollutant removal by green roof vegetation with actual rooftop experiments. My research in Manchester (Speak et al. 2012) was an attempt to fill this research gap. The methodology was quite simple. Basically, I grew trays of four different green roof plants in a greenhouse and then transplanted the trays onto two different inner city roofs with some trays left in the greenhouse as a control. The leaves were then sampled every few days over a summer period and magnetic analysis techniques (plus particle counting in electron microscope images) were used to quantify the particulate pollution captured on the leaf surfaces. The magnetic technique is suitable because PM10 contains magnetic iron impurities from combustion and abrasion processes. The species chosen were two grasses (Agrostis stolonifera, Festuca rubra), an invasive weed (Plantago lanceolata) and, of course, the green roof industry workhorse – Sedum album. Species differences in particle capture were apparent with S. album unfortunately being outperformed by the other species. The grasses had the higher particle capture rates probably due to their more erect structure which enables the filtering of more air than the low-growing Sedum. Microscopic differences in leaf structure may also be responsible, with grasses capturing more particles in tiny grooves. Differences were also seen between the two study roofs, with a roof next to an inner city motorway exhibiting higher particle capture than a roof representing more urban background pollution levels. 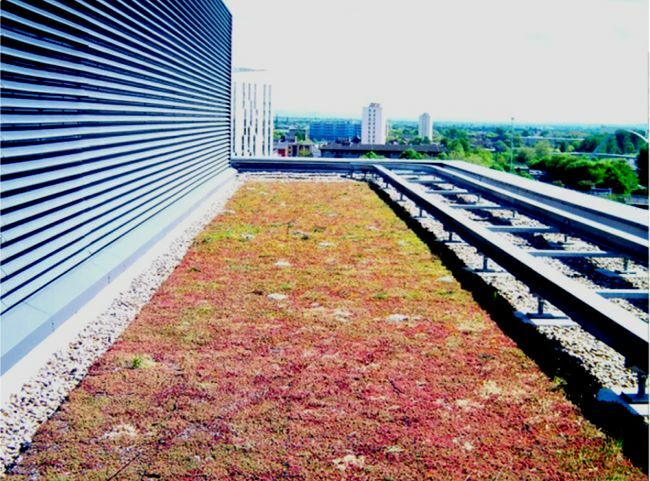 The removal rates from the study were plugged into an upscaling scenario that involved all flat roofs in Manchester centre getting a sedum green roof – a pretty ambitious idea! Even in this green roof utopia only 0.2 tonnes (2.3% of the PM inputs) could be removed in a year. Larger plants, such as grasses and shrubs, would have a bigger impact, but are more expensive to install and maintain than an extensive Sedum green roof. Sedum removal rates are approximately 0.4 g per square metre of leaf surface per year compared to the average for trees in U.S. cities of 3.8 g.
Extensive (above) and intensive (below) green roofs in Manchester. The take home message from this work is that green roofs have a modest impact on urban air pollution compared to urban trees – but they DO have an impact. Intensive roofs are better because the larger plants (shrubs and trees) that the deeper substrates can support have a larger leaf surface area per unit area of roof. If a green roof is being created for air pollution remediation purposes, species differences should also be considered. Future research could uncover some ‘superplants’ – pollution-busting species which provide enhanced removal rates as well as the other green roof benefits such as localised cooling, rainwater retention and of course, looking great! Location is also important to consider, with proximity to sources being an important factor. Little research exists on the reverse situation, i.e., what effect does pollution have on green roof vegetation? One study looked at the effect of road-salting in cold climates and found five Sedum species to be relatively tolerant except for S. reflexum, which suffered (Whittinghill and Rowe 2011). Pollutants, once washed off the leaves, can accumulate in the substrate layer, which may have negative impacts as a green roof ages. My most recent study investigated the impacts on runoff water quality of a 43 year old green roof. High lead levels were observed which were possibly from historic atmospheric deposition of pollution in the days before the phasing-out of leaded petrol, which accumulated in the green roof soil (Speak et al. 2013 – in press). So, the next time you hear that green roofs are great for air pollution, hopefully you will feel a little better informed about this aspect. Green roofs can, indeed, contribute to air pollution reduction in cities, albeit modestly. Sedum roofs aren’t actually that great, so bold choices in plant choice and substrate depth should be encouraged. Future research may reveal a list of pollution-busting plants, and also show how green roofs impact on other pollutants such as ozone. And this way, green roofs can truly be used to combat the invisible threat of urban air pollution.